I couldn’t find any information. And my heart was running on skeptical. I simply did not believe Duran Duran was coming back to Atlanta. So, by that Thursday it was “a joke” to me. Tweets, FB updates and other cool things from the band poured in…but nothing mentioned Atlanta. I spoke to Denise in Toronto who was still dancing on the Valentine. I chatted with Sir David Esquire…none of these Duranies had heard about this show or they would have told me. So now I was confirming in my own mind no such thing was going to occur. All of the sudden the room began to spiral out of control. Like a hellish Halloween nightmare the light fixture seemed to blink and the earth went dark with a moon falling toward me…I had to roll out of the way! “ohhh my Gaaaahhhd! It wasn’t a joke. It wasN’T A JOKE! IT WASN’T A JOKE!! !” (YES, by now I escalated to a “freak out” in her office. I mean, up stomping around with my hands in the air…then of course I had to sit down cause I felt like I might faint.) My heart was racing. I felt tears swell up in my eyes. She looks at me with shock and says, “Tell me YOU knew about the show right? You need a ticket?” I sat there at her mercy. “Yes, I need a ticket. I thought it was a joke. I saw the advertising but I thought it was out of state…I thought…” I went on for a few minutes hands flailing and explaining as if she needed to know every detail. She sympathized with me and made some phone calls. Then she turned to me and said, “I’ll know by 6pm.” And with that, I left her office with my head hanging down and slumped back to my desk to recoup and re-concentrate on the tasks at hand. I was so focused that I finished my assignments one hour earlier than usual and then headed out to hopefully hear back from her later. I went home later that night feeling terrible. I fell in the floor after a few tweets and went to sleep. Devastated and determined, I vowed to myself to not ever let such a thing happen again. How could I ever assume that a Duran Duran show may not happen just because the band said nothing about it. Sure, it’s logical, but still, I’m a raqs and rock band superfan I shouldn’ve known better. It was different than what I expected. We got there on time which was about 8’oclock. No one was there. Just a few people…and they were in costumes. It was like a Halloween party. 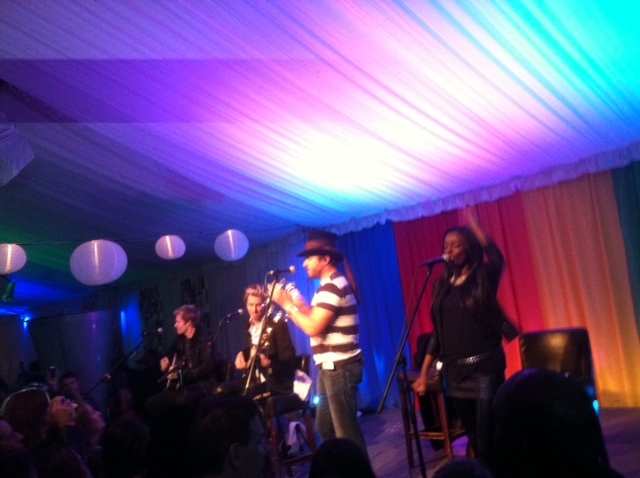 Then about 10 or 10:30 Duran Duran comes out, gets up and does a cool acoustic set of 4 songs. Simon was there in a big top hat with a tie around it. He was the only one standing. The rest were seated for the most part. One of the pretty girls that’s touring with them now was also there…the one with the long black hair. A slender guy and I think JT was there. They sang 4 songs…asked if they were in Atlanta, which in hindsight was weird…and well, that was about it. We expected more but hey…you know. Overall, I should’ve been there at Park Tavern. The odd unfairness of that moment makes me queasy and I was sick all night and all morning. I got sick on the commute into downtown atlanta this morning too. I just should’ve been there. I’d have sat peacefully and well-behaved. If I can sit and listen at a Curt Smith Solo show I can sure as heck behave at DuranDuran… So, here I go throwing myself into the pile of Duranies to legally stalk Atlanta news feeds and hunt down any information that says they’re coming this way again…an intimate venue with Duran Duran is just what I need. I’m perched. I’m ready! Let’s go! Posted on 01/11/2011 16/11/2011 by International Business and Cultural ExchangePosted in Tears for Fears Reviews (incl. bands they've worked with or like) by Music Industry and FansTagged Atlanta Music, Curt Smith Solo Shows, Duran Duran, Duran Duran in Atlanta, Park Tavern, Rock Band Superfans, Sir David Esquire Photography. so why is this in a tears for fears blog? if you are a true Duranie you’ll know why. I can totally appreciate and understand where your pain comes from with this. I too have been in this situation and others similar and not so similar before. Awesome article! Loving the verbiage & how you were able to paint your emotions into words allowing the reader to take your words and paint them into pictures in their minds. Or maybe that’s just me. HeHeHe! There are not enough thank yous Sir David, you really were helpful this day. Yes, it was certainly an ordeal for me…considering… thank you again!